“I express to the Libyan people my apologies for the unjust arrest of Libyan diplomats by Geneva police,” Swiss President Hans-Rudolf Merz said at a joint news conference in Tripoli with Baghdadi Mahmudi, the Libyan prime minister. Unjust? Or just “unseemly and unnecessary”? “Ungebührlich und unnötig” is the original term used by the Swiss finance minister and it actually translates as “politically uncorrect” in this context. “Unjust” is the wrong translation conveyed by certain news agencies and welcomed furthermost but not exclusively by the Arab news world. The dispute with Switzerland began when Hannibal Ghadaffi and his pregnant wife Aline were arrested in a Geneva hotel in July 2008 on charges of mistreating two domestic employees. Armed police forced open their hotel suite after being alerted to repeated altercations. Hannibal Gadaffi and his wife, along with the Libyan state, had then filed a civil lawsuit against the Geneva authorities in a Geneva court. The couple were released on bail after two days, and charges against them were dropped in September after the servants withdrew their complaint, having reached a financial arrangement with Hannibal according to “Swissinfo” (April 9, 2009). Nevertheless, relations between the two countries continued to be strained with Libya taking a number of retaliatory measures against Switzerland which included the arrest and later release of two Swiss nationals who were refused permission to leave the North African country up until this day. The foreign ministry says one of them is unwell and has appealed to the Libyan government to allow the citizens to leave the country on humanitarian reasons. It is ironic that one year later, the Swiss President calls this legally correct arrest “unseemly and unnecessary” and delivers this public apology to killers. Who will now protect the Swiss against further “diplomatic” provocations? Wasn’t just this apology unjust and unnecessary? • Are Swiss visas issued before the 12.12.2008 still valid? Yes, they are valid. However, Swiss visas issued before the 12.12.2008 are only valid for Switzerland. If the person wishes to travel to another Schengen State, he has to apply for a Schengen visa in the corresponding country. In principle, yes. But I take my passport with me. For questions regarding the requirements governing entry to other countries, I contact the competent authorities of the country concerned. • Does a Romanian or Bulgarian passport entitle the holder to enter Switzerland without a visa? Under prevailing law, Romanian and Bulgarian nationals require a passport for entry to Switzerland without a visa. • I am an Indian national and the holder of an American Green Card. Do I require a visa for entry to Switzerland after the entry into force of the SAA? Yes. The same also applies for third-country nationals living in the United Kingdom or Ireland. • Under what conditions is a passport recognised? A passport is recognised if it indicates the identity of the holder as well as the fact that he/she is a national of the issuing country, the fact that it has been issued by a country recognised by Switzerland and that this country guarantees the return of its nationals at all times. The FOM may authorise exceptions from the passport requirement. Please find the above frequently asked questions and their answers among others at the homepage of the Federal Office for Migration. December 12, 2008, marks the date in history when Switzerland will join the passport-free zone of the Schengen countries, after interior and justice ministers of the 27 EU member states formally approved the accession of this non-EU country today. Switzerland will be the 25th member of the Schengen area which counts three other non-EU countries (Norway, Iceland and Liechtenstein) among its members. All land border checkpoints are to be closed on that date, while people entering Switzerland by air from another Schengen country will still have their passports checked until March 29, 2009. This is good news not only for tourists who can hence travel freely into Switzerland using their Schengen visa. Non-EU residents of Switzerland will no longer need to apply for a visa to cross the Swiss borders but will be able to travel freely to the neighboring Schengen countries. The agreement to set up the Schengen zone was signed in Schengen, Luxembouerg in 1985. The EU member states Britain and Ireland have abstained from Schengen membership, which among other things grants access to Interpol, a common police database. Real Liberals or Rather Puppets of Secret Societies? In a recent post, I mentioned Christoph Blocher as an example of what can happen to a liberal nonconformist these days, even in cosy Switzerland. The billionary and former CEO of Ems Chemie was refused to be reelected as member of the Swiss Federal Cabinet (Bundesrat). To think of it, the Bundesrat consists of the representatives of all major parties of Switzerland. It thus forms a big coaltion in this executive body. Two members are from the Swiss Peoples Party, Samuel Schmid, Minister of Defence and himself, Minister of Justice. With nearly 30% of the voters’ support, one could have presumed that this representative of Switzerland’s most powerful political party will be undisputable in the executive body. The world’s most direct democracies is where ordinary people can ask for a referendum vote by means of 100’000 signatures in order to change an act of the Swiss Constitution. It is a completely different thing when it comes to the election of the Cabinet. The ordinary folks have absulutely no say in that. This is entirely the domain of the 200 Members of Parliament. In a big coaltion like this where the big four parties are all entangled in the government, you have to be a team player being diplomatic with your Cabinet colllegues, with the members of the two chambers of the Parliament, with your staff. Not so Mr. Blocher. He sacked people whom he did not like, and he often did not support the consensus opinion of the government. To make this short, what I really like though about Blocher is the fact that his mouth spoke out what was in his heart. He was absolutely not corruptable. He would not dance, you bet, not for the political left, not for the European Union, not for the ideals of the United Nations. He was an independent all the way lobbying for freedom from government and international control whenever he could. He is the founder of AUNS, the pressure group for an independent and neutral country. What is freedom? What is independency anyway? Across the Atlantic Ocean, we look out for a candidate for Presidency of the United States who will bring back the American dream of a free and prosperous society, as they say. Have you ever heard of Ron Paul for President? Isn’t it that the media kept talking about Hilary Clinton and Obama? As a Swiss, the first name of the Republicans that pops up in my mind is Giuliani. But surprise, surprise. In Wyoming, Ron Paul, the one-time Libertarian candidate and 10-term Republican congressman from Texas, was in second place. That’s right, Second Place… ahead of all other Republicans except Romney. I am not quite sure. I just have a feeling in the water that a recent bestseller in the U.S. had a major inpact in this Pre-Election campaigns. As the saying goes, a secret society is no longer secret. The Bilderberg Group has been observed closely during their 2006 Ottawa meeting. A documentary was born. In this more than two hour coverage, the same Ron Paul, who just scored silver in Wyoming was shortly interviewed, with regard to the possibility of world dominion by a tiny elite of a secret society. In this movie, he said clearly what he stands for. Freedom from international corruption. And he is a Texan, this is a resistence camp against international dominion just like Switzerland’s indepency being constantly challenged by the surrounding European Union. And Texas sees evidence of rising powers just in front of their doorstep. A supranational tollway is being built between Mexico and the U.S.. it is happening right now. Is this the paveway to the North Atlantic Union with the NAFTA owning the future highway system? This is not the first time in history that world dominion has been attempted. But this is just the tip of the iceberg as you can see in the movie. May I express my hope that the American people will elect Ron Paul for President. This will at least delay the New World Order as proclaimed by President Bush Senior. God bless free countries like Switzerland and the United States of America. How long will they still be free? What’s so cosy about Swiss Government? Cosy is the consensus politics which is so typical for Switzerland. The Swiss are masters of negotiating – and lovers of compromises. So it is not surprising that the Swiss are ambassadors between countries such as the U.S. and Cuba which have no direct diplomatic relationship. But this is beside the point. The term “consensus politics” describes the ongoing effort to achieve a balanced compromise among political parties and among the different cultural, linguistic and social communities that make up Switzerland. One of the most obvious aspects of the Swiss power-sharing system is the way in which the distribution of cabinet seats reflects the relative strengths of the political parties. Now, the Swiss cabinet (Bundesrat) consists of seven Federal Representatives). Two of them officially represent the Swiss Peoples Party (SPP) that has become famos for its billboard compaign with the white sheep kicking out a black sheep out of the country. Christoph Blocher was the figurehead of the SPP which got almost 30% of the voter’s support during last October’s national elections of 200 MPs. It is thus the most powerful political party in Switzerland in terms of members of parliament. Here comes the big surprise: The same parliament refused the reelection of Bundesrat Christoph Blocher! This has happened only the forth time in Swiss history. They elected a woman, Eveline Widmer-Schlumpf, finance minister of the Canton of Grisons and daughter of a former cabinet member, in an undercover campaign launched by exponents of the political left! Left: The flag ship of the Canton of Grisons kicks out Blocher. This prompted the Swiss Peoples Party to go into opposition against the members Samuel Schmid and Eveline Widmer, who are now elected as representatives of their own party. They want to be called an opposition party from now on. Something new in the consensus loving Swiss Confederation. Update November 17: Kidding aside. Bundesrat Blocher is going to run the office until the end of the year. He has gone back to statesmanship mode in the meantime. While the president of the SPP fraction, NR Caspar Baader, stirrs the drums for opposition loyalty within the party of Blocher, the humiliated cabinet member, Blocher himself now has toned down the opposition hype in the Sunday news. He is not interested in politics of obstruction. “This will not be beneficial for the people,” he said. This kind of moderation is probably a good move. 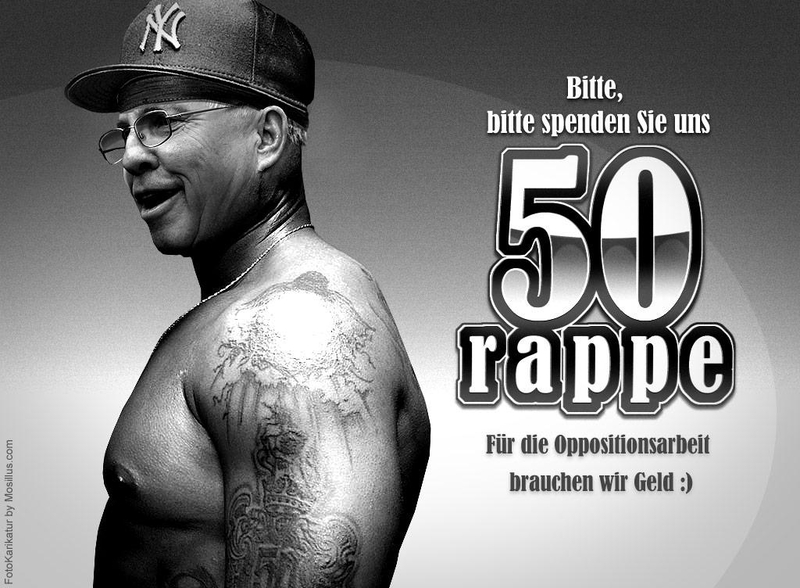 For effective opposition campaigns, Blocher needs a mandate in parliament not just a presidency of the SPP party. And yeah, he still needs the whole party for that. People who step down for him to inherit a mandate is one thing, a loyal party without fracture is another thing. Meanwhile, Widmer-Schlumpf will have to move from Chur, Grisons, to the capitol of Berne. Her son offered her a room in his apartment-share, she told the Monday press. This can be read on Hingis’ website forum ( Hingis Forum ) . She is so much smarter than she may look like during her last TV-spot presenting her V-Zug high-tech household machines. She said she is not an “ace” in cooking and played dumb gittery during the spot. The PR gurus played with Martina’s cute innocent smile and nearly perfect reputation. Now it’s all gone. V-Zug will stop the TV-spots that were planned until the end of the year. Because Hingis’ confession of the Wimbeldon B-test reconfirming that their was cocaine in her blood was a shock that even struck the sponsors. But like Addidas, V-Zug doesn’t want to cancel Hingis’ contract for now. Yonex could even imagine to write an ambassador contract for Hingis, yet depending on the development of the case. But this is not enough of the confusion. There was no official information of Hinggis’ doping case to the International Tennis Association. It all came from Hingis’ mouth. Why? Earlier this year she said she was so motivated, and she won another couple of titles since her comeback. it all looked so promising. But it was just too much for her nerves and her already worn out body. May be her mother Melanie pushed her too hard during her youth? At 18 she fell off her horse and needed to have a surgery on her knees. Then her complicated foot situation – the pain is back. Then her hip hurts. I understand that she does not want to publicly fight the case for years while still playing, and thus risking a clash with the Tennis Association lateron. It was the right moment for her to retire from World Tennis. Somebody in the forum mentioned that Martina was wearing her engagement ring again. That could be a test for the man who may still love her now. Will he take his chance now, while many of those who used to laugh with Martina, will turn their back against her?